After speaking to 50 people about muskies on behalf of ProNature outdoor store in Rockland I ended up talking to Glyn about taking his son Ben out on a birthday musky fishing trip. Birthday trips are awesome and father and son trips are a chance for a special bonding experience on another level. Glyn was from The Rock and was familiar with salt water fishing but neither he nor Ben had much fresh water experience. When Glyn asked about a musky day I suggested that we do a multi-species trip instead. and learn about different kinds of fish and ways of fishing. Musky fishing is working hard or trolling all day for hopefully a couple of big fish and that is not always the best introduction for younger folk. Allowing them to learn about a variety of easier to catch fish and how the system works can be more entertaining day. We started out bottom fishing and low and behold the cats and walters were in the mood for something to eat. I was hoping for a dozen fish but we ended up with closer to 20 fish. 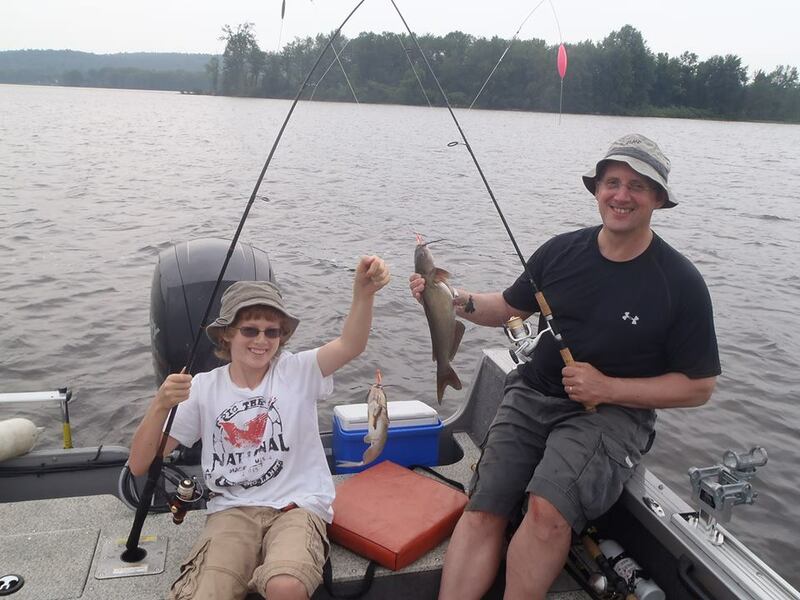 Glyn learned how to hold both walleyes and catfish and took lots of pics and video. After that we went in to a bay and introduced Ben to a few pike. Ben found dragging pike out of heavy coontail is tough stuff but you can tell from the picture that he really likes them. After a bbq and a thunderstorm we headed out to try to complete the cycle with the home run fish. The river was still in a generous mood and about an hour before sunset we completed a dream birthday present for a 13-year old. Dad said ‘WE HAD THE TIME OF OUR LIVES. Thanks so much.’ Ben said it was the best birthday ever. Can’t ask for more than that out of a day.